Heat the oven to 375 degrees. Break the eggs into a small bowl. Heat a small skillet. The temperature is right if when you flick water into it the water dances like mercury drops. Make a note of the setting and the time so you get good at it. Add the butter and let it melt and bubble but don’t let it brown. Whisk the eggs until the white and yolks are well blended and pour into the skillet. Wait until there is a 1/4″ wall of cooked eggs around the sides, then pull the sides in towards the center in using a wooden spoon or heat resistant spatula. Keep pulling in the sides as they cook making room for more of the raw egg to fill the spaces. Put the tortilla in the oven. When the eggs aren’t running anymore, start turning the eggs over to get the top fully cooked. Remove the skillet from the heat to stop the cooking before anything browns so they stay light and fluffy. Overcooked eggs lose their taste completely and are rubbery. Sprinkle the eggs with salt and pepper, then the cheese. 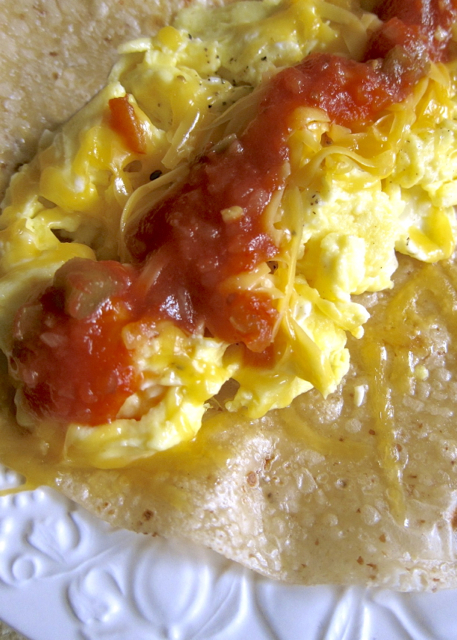 Take the tortilla out of the oven and place on a dish. 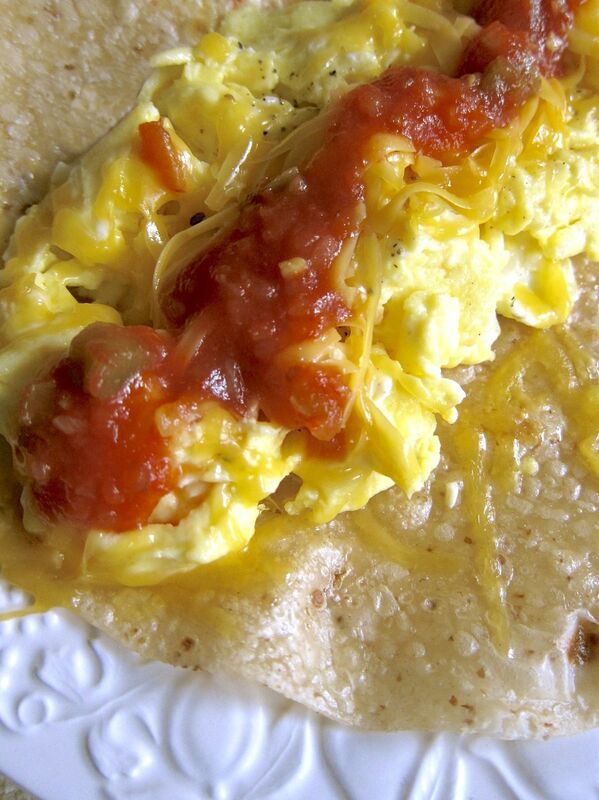 Slide the eggs out of the skillet on to the hot tortilla, spoon the picante sauce down the center and roll up. *You can use coconut or another oil but when it comes to eggs, butter makes a big difference in taste.